I stared at the pink slip in my lap and felt the dread of what was to come chill my veins. Sitting across from my boss, Ron, I struggled to find words for this situation. “Are you okay, Andy?” I looked up, realizing the overweight grey wolf had been trying to get my attention. “Sorry Ron, but I don’t understand. Loraine was being harassed. You’d rather me do nothing?” I responded in disbelief, holding back tears of frustration. “No, I expect you to be professional. He’s a payin’ customer, ain’t he? So you don’t go callin’ them perverts and such.” Ron said as he brushed crumbs from his muzzle, probably from the last time he gorged on leftover food from the diner. “I’m sorry, Andy, but I can’t have you harassin’ the clientele, neither. You’re lucky I didn’t call the authorities.” Andy replied with his toothy insincere grin. I felt my nose start twitching, and my long ears flicking erratically. All the fur on my body was standing on end. “Well fine, Ronny, but you should know that everyone here thinks you’re a fat, lazy, ugly, misogynistic, no-brained, i-idiot!” I shouted as loud as my anger could manage. Ron looked at me slack-jawed, and I ran out of his door, seeing twenty odd faces staring in shock: children, mothers, fathers, the dirty old squirrel who grabbed Loraine’s behind, and all of my coworkers smiling for being given a voice to their mistreatment. I waved half-heartedly and quickly exited the building to catch a bus home. I felt humiliated and perturbed. Losing this job couldn’t have happened at a worse time. I boarded a bus that pulled up as I approached the stop. Drawing confused looks in my baby-blue uniform with a creamy yellow apron, I sat in an empty seat near the back. How am I going to afford rent this month, let alone food? You shouldn’t have opened your mouth, dummy. Mom always said to stand up to creeps, what would you have done if he was trying to touch your sister? This had been the first job I was able to find after my mother passed a year ago. I was taking care of my sister Jenna because we didn’t have any other family. I had to drop out of high school to get a job after mom’s money ran out, but without even a GED I could never earn close to what she made. So we moved to a small apartment I could afford on a waiter’s meager income. I had been saving a third of my tips to build up a fund for my business loan, but after getting fired, that had to be put on the back burner again. The last time I dipped into that fund, Jenna had broken her arm falling out of a tree. I guess rabbits weren’t made for climbing. The bus came to a stop and I made my exit hastily, giving the driver a quick nod of thanks. I was lucky that we lived near the bus stop, because I could finally get out of that ridiculous outfit. I walked up the stairs to the door of my apartment and opened it to find my sister laying on the couch texting. She dyed her fur black since I left for work; I guess she didn’t care for matching my white and orange spotted motif. When she didn’t react to my arrival, I said pointedly, “I’m home, Jen,” ripping my apron off and plopping into the armchair opposite of her. “Bad day?” she asked not looking up from her phone. “I don’t want to talk about it.” I sighed. She shrugged and giggled, showing me a picture of my boss Ron being distorted by photo editing to look even more bloated than he appeared in reality. I rolled my eyes and chuckled. “So what do you want to eat, bud?” I asked as I got up and strode over to the kitchen. “Um, something quick, Aria and I were going to study for our Algebra 2 test tonight.” Jenna replied, getting up from the couch and sitting at the counter on a creaky stool. “How about some Ramen?” I suggested, already pulling out ingredients. She nodded excitedly, which made me smile. I began by heating up some vegetable stock I had made a few nights ago for the base, then adding some chopped mushrooms, green onions, and ginger. I liked buying the noodles fresh, but we were tight on money so I grabbed some packs from the cupboard and began boiling them in a separate pot. Now was usually when I would add the protein, but Jenna wanted to go vegetarian, and I obliged except for the occasional california roll. It was times like these that reminded us of our mom. We would both sit and watch her cook, even when Jenna was a little baby bunny. The warm spice of the ginger and savory mushroom aromas signaled the noodles were done. I served them in bowls and carefully ladled the stock into each of the dishes, making sure to give all the onions to Jen and mushrooms to me. We have preferences. I even finished them off with a dash of toasted sesame seed oil. Jenna quickly devoured the bowl, burning her tongue and fidgeting awkwardly in pain. “It’s hot.” I mumbled cheekily. “Yeah, no crap, old man!” she shouted in pain, fanning her tongue. “I’m not old, I’m dignified,” I chided back. She rolled her eyes, and got up from her seat. “Aria is going to be here any second, I’m going to meet her outside,” she said, and with that she left a small bunny shaped cloud of dust and was out the door, leaving me with my soup. “Be careful!” I shouted halfheartedly. I knew she was already out of earshot, but I worried. I finished my dinner, then broke out a bottle of the cheapest wine I could find and my secret book. My cook book. The great book of baking that had been handed down through my mother’s family to me. Its pages were worn and stained with ingredients and possibly blood from my ancestors who all shared the same passion of bringing people together through food. And tonight I was making some of Great Grandma Irene’s blackberry pie. I remembered when my mom made it for me the first time. It was when I was about six years old and she told me she was pregnant with Jenna. I cried for about an hour because I didn’t want to share my mom with anyone. Mom didn’t get mad, she just set up a station in the kitchen for me to work with her to bake the pie. I hadn’t made it since before the funeral, but she was right, every bite tasted like love was baked right into it. I pulled out all of my ingredients from the fridge and began creating the crust. First I prepared the nearly rock hard butter by cutting it into tiny cubes and sifting the flour, sugar, cinnamon, and salt. I put on some gloves so I wouldn’t get any fur in the dough and began working the butter into the flour mixture until it resembled a mass of buttery crumbs squished together. I wrapped it and put it in the fridge to cool and started prepping the fruit mixture. We usually bought frozen fruit because they get frozen at peak ripeness, and often are cheaper, but our neighbor Lindsay bought too much at the market and gave us what she didn’t use. Mixing the berries with sugar would draw out the natural juices, helping to create the fruity filling. Then it was time for me to realize I forgot to preheat the oven, so I walked over and set it to 425° fahrenheit. With some time to kill, I poured a glass of that wine and began chugging the glassful eagerly. I wish you were still here, mom. I don’t know what I’m doing. Everything is a mess. I grabbed the dough from the fridge and lined the tin, placing it in the oven for pre-baking it so it would maintain an optimal texture while baking. I used the excess dough to make pieces for decorating the top. I learned how to braid the dough from mom, but I never was as good as her. These looked alright though. I poured the berry mixture into a sieve and squished it through the mesh. This removed the seeds, which Great Grandma Irene said ruined the texture. I grabbed the pie dough from the oven and waited until it cooled enough to begin decorating it. Then I poured the voluptuous purple berry mixture into the crust and began decorating. I finished the top with an egg wash and a sprinkle of raw sugar before putting the pie in the oven, then sat down on the floor in front of the couch with my legs outstretched, sipping another glass of wine while I waited for the baking to finish. As the pie neared completion, the whole apartment was filled with the scents of warm berries, sugar, and butter. There’s magic in turing all these parts into delicious treats, memories, and dreams. I always wanted to be a cook, except for the one year in highschool I got super into theatre, but everyone has their awkward phase. I was even accepted into a culinary school before the accident. Mom was driving home from her shift at the emergency room when a drunk driver t-boned her. The paramedics said she died on impact; we never got to say goodbye. After we had done all of the paperwork we received her life insurance policy money, but that didn’t last even half a year. I dropped out and got a job at that stupid diner, and got this equally infuriating apartment. Sometimes I wondered what would have happened if mom had walked through the door that morning, instead of that police officer. The timer on the oven rang and I quickly got up from the floor. Should probably go easier on the wine, champ. The pie was perfectly golden brown, and in between the lattices you could see the berries sizzling gently, curls of steam rising up from the openings and bringing the sweet scents to my nose. It looked and smelled just like mom’s. Maybe not Great Grandma Irene’s; she was unanimously voted our hometown’s greatest baker. Every year they held a competition that awarded the winning dessert recipe a spot in the famous food magazine, Nibblez, and a cash prize of $50,000. After the third year, they had to ban her from competing to give other people a chance. The bake-off was sponsored by the founder of the magazine himself, Theodore Nibblez - that wasn’t his real last name; I think he changed it. He actually had grown up in that town, and that’s why I thought maybe I had a shot. Jenna usually stayed the night at Aria’s place when they studied, but I texted Jen really quick to double check. She replied and confirmed my assumption. It was always so quiet when she went out, except for the creaking of my upstairs neighbors’ bed. Last week I had downloaded a dating app on a whim while I was drunk. I opened the app, named OWO, and stared with anticipation at the loading screen; a simple design of a stylized canid face with large eyes. I was hoping to find some time for myself now that Jen was back in school, and maybe someone who is rich and a prince who could sweep me away to an elegant palace, and out of this cramped box. Or just a nice handsome...oh dear. I noticed I had gotten a message from a well-toned jaguar who was shirtless in his picture. I rolled my eyes, and opened his profile. He was 6’2”, into classic rock, football, blah, blah, and blah, some more blah. Leaving the generic and uninteresting bio behind, I read the message and felt my blood rush to my face. He didn’t seem to be online at the time, so I closed the app and went to check on the pie. From my drunken stupor, I felt a bit more courageous touching the hot pie tin. Just then I heard a buzz from my phone. My whole face lit up and stomach began twisting in knots. I bit my lip and slowly slid my paw on the counter to my phone and tapped the screen. The notification was actually from Jenna, reminding me to save her some of whatever ‘baking abomination’ I made while I drank. I sighed dramatically and plopped onto the couch just like Jen was earlier, legs on the arm rest and head on the other. It was crazy how tall she had already gotten before I even started puberty; now she’d caught up to me. I began to make a mental list of what I needed to start doing when I woke up. I figured as long as I could collect unemployment, I can take a little extra time finding a job. There was a bakery down the street that had just opened up, but they were paying a few dollars less an hour than my current job. I guess I could work two jobs. But I already leave Jen by herself too much. No one ever tells you how complicated adulthood is. Hopping to my feet, I grabbed the pint of vanilla bean ice cream from the freezer and plated a piece of the oozing warm blackberry pie. I dolloped the top with the ice cream and grabbed a spoon. I spread the ice cream all over the piece of pie so that in every bite I could get the creamy vanilla mixed with the flaky crust and fragrant, tangy berries. Nothing is more satisfying than a well baked pie on a bad day. I hope Jenna can feel the love I baked into this pie, so she knows I’m trying. So hard. To be a brother, a father figure, a friend, whatever she needs. My phone buzzed again and I tapped the screen. Nicknames already? Must have made an impression. My name is Tim. How are you doing today Andy? I had a crappy day honestly, how about you? Smooth. I watched the chat window eagerly for another response, and my patience was rewarded. I’m sorry to hear that honey bun, what was so bad about it? My face began to get hot again; I could practically feel his purr through the message. Did he actually call me that? It’s so...cute...or gross...I’m not sure. Well, I got fired from my job today, but my boss was a jerk anyway. But I got fired for the dumbest reason, there was this old pervert groping waitresses at my diner, and I called him out. I had to, right?! I facepalmed and realized this guy was just being polite. I knew I was sharing way too much; surely he was going to think I’m weird. My phone buzzed and I began reading. That’s ridiculous! If I was your boyfriend I would’ve kicked that guy’s tail! You are so sweet. Well I have to celebrate your victory over this terrible job, so how about tomorrow night. I’ll pick you up? What about Jen? And I have so much to do tomorrow. I have to tell him I’m busy. Yes, I’ll send you my address. 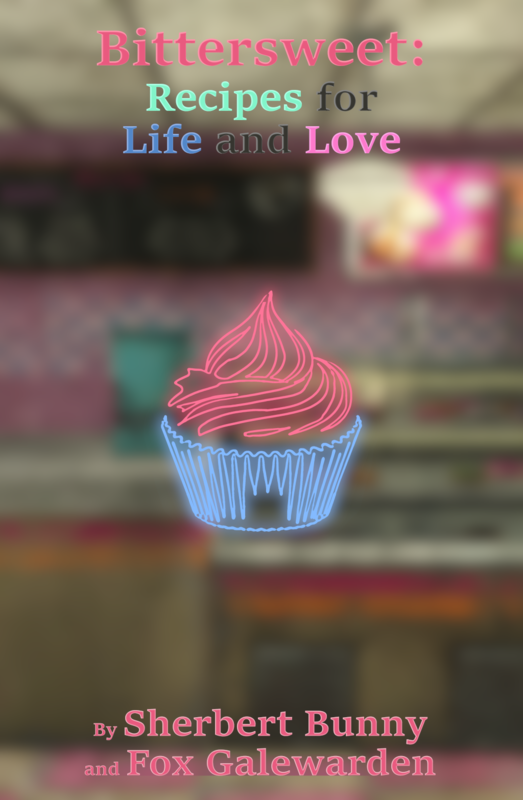 This is Chapter 1 of Bittersweet: Recipes for Life and Love, a gay romance/drama novel that I and my fiance, SherbertBunny, are writing together. The novel is about a rabbit named Andy, an aspiring baker hoping to find love, happiness, and a purpose while taking care of his sister following the death of their mother. Keep an eye out for our upcoming Kickstarter to get the full book published! If you liked reading this, please share it! We're new authors and we would greatly appreciate a signal boost. Note: This story will eventually contain dark themes which some readers may find distressing. Please exercise care when reading.